Nucleic acid is polymer of nucleotides. A German Chemist. Friedrich Miescher. discovered Nucleic in 1869. Ile discovered DNA only four years after the publication of Menders work. Miescher extracted a white substance from the nuclei of human cells and fish sperm. He called this substance nuclein as it was associated with the nucleus. The nuclein was acidic in character. So the nuclei]] was called nucleic acid. Research revealed its significance in the. last half of the 20th cent. RNA was first made by laboratory synthesis in 1955. In 1965 the nucleotide sequence of tRNA was determined. In 1967 the synthesis of biologically active DNA was achieved. The -amount of RNA varies from cell to cell. 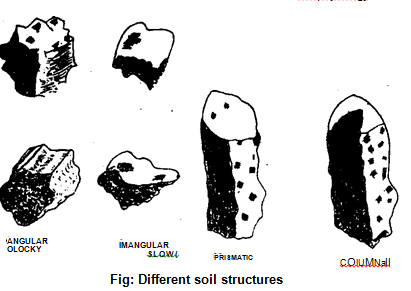 But the amount of DNA is normally constant for all typical cells of a given species of plant or animal. ,viruses. They play a central role in the storage and replication of hereditary information and in the expression of this information through protein synthesis. In most organisms, nucleic acids occur in combination with proteins. The combined substances are called nucleoproteins. Nucleic acid molecules are complex chains of varying length. The two chief types of nucleic acids are DNA (deoxyribonucleic acid). DNA carries the hereditary information from generation to generation. RNA (ribonucleic acid) delivers the instructions to the cell’s protein manufacturing sites (ribosome). Pyrimidines: These are thymine. T and cytosine, C. RNA contains uracil, U instead of T.
in long chains. 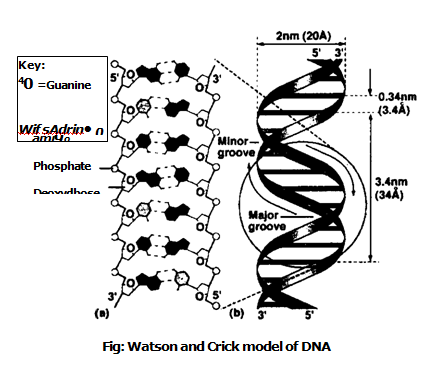 Linear strands of DNA or RNA always have a free 5′ phosphate group at one end and a free 3′ hydroxyl group at the other. I. It is a genetic material. 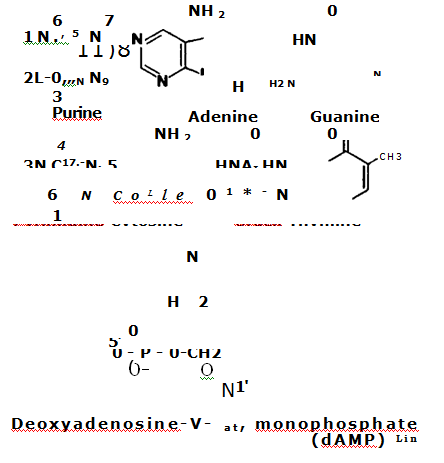 It codes for the sequence of amino acids in proteins and control protein snnthesis. It replicates itself before cell division. It is present in the nucleus of cukar)ode cells. It can change over time for evolutional) changes. DNA is polymer of deoxy ribonucleotides. It contains four nitrogen bases: Adenine. 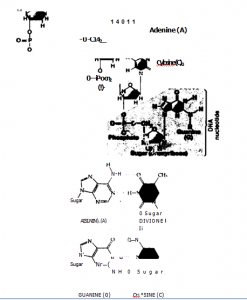 guanine. thn mine and c>tosine. Uracil is absent in it. 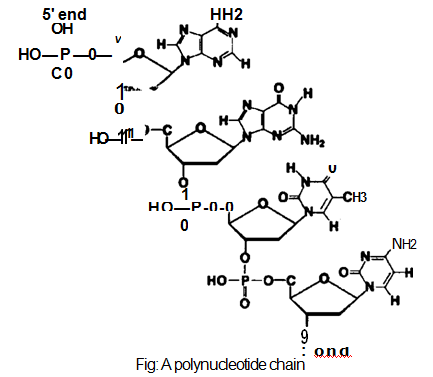 The nucleotides are linked w ilk one another by phosphodiester bonds and form a long chain. This chain is called PolynOcleotide chain. This chain has a specific sequence. There may be different lengths of nucleotide chain. Erwin Chargaff provided a data about the ratio of different bases of DNA molecule. It shows that adenine and Thymine have equal ratio and guanine and cytosine have equal ratio. Function of DNA: The intbrmation carried by a given gene is coded in the sequence of nucleotides. 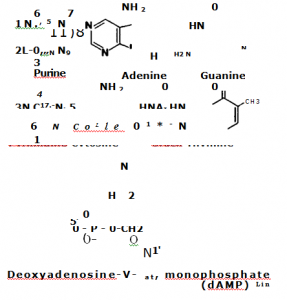 These nucleotide sequences determine the sequences of amino acids in the polypeptide chain of the protein. There are long portions of DNA called satellite DNA between the genes of DNA of higher organisms. Satellite DNA code no proteins. Sometimes junk DNA occurs within a gene. In this case. the coding portions are called exons and the noncoding (junk) portions are called introns. Junk DNA makes up 97% of the DNA in the human genome. Little is known of its purpose. I. The DNA is helical in shape. It is made up of two strands. The phosphate groups were present outside the helix. But the nitrogenous bases are present in the interior of the double helix. Franklin’s X-ray data indicate that the helix makes one full turn after every 3.4 nm of its length. The pairing of the nitrogenous bases is complement. Adenine pair with thymine (7) and guanine (C) with cytosine. 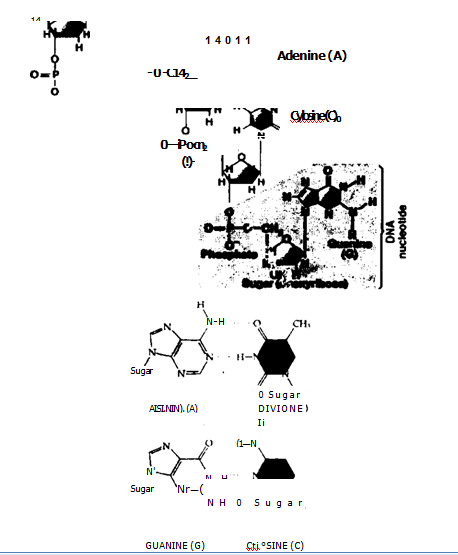 Adenine and Guanine are larger bases. They have two ringed structures. They are called purine base. On the other hand. the cytosine and thymine are pyrimidine bases. They have single ring. In this way one purine and one pyrimidine combination keep the diameter of the DNA uniform. Both strands of the DNA afe anti parallel. One strand is in 5 —3 direction. The other strand is in 3 — 5 strands. The helix of DNA has two grooves. One is major groove and the other minor groove. Both These grooves alternate with each other. The polymers of ribonucleotides are called RNA. The RNA molecule has single strand. Sometimes, this strand may fold back to give double helical characteristics. The nitrogenous bases form complementary pairings. RNA have nitrogenous base Uracil in place of Thymine. Cytosine (C) forms pair with Guanine (G) and Uracil (1,1) forms pair with Adenine (A). DNA synthesizes RNA. 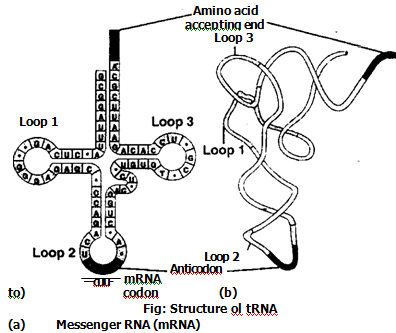 The process of synthesis of RNA from DNA is called transcription. proteins from the genetic in (gene). The mRNA brings genetic. message from nucleus to the ribosome. The rriRNA is about 3 to 4% of the total RNA -in the cell. ‘The ribosomes are present in the cytoplasm for the synthesis of the particular protein. DNA transfers its genetic information to niRNA. Now. this iii RNA has genetic information for the synthesis of specific protein. ‘Ibis mRNA. attaches with the ribosome for sAnthesis of protein. The int2 \ A consist; of single strand of variable length. Its size depends on size of gene (on DNA) for the specific protein. For example. the inRNA has 3.000 nucleotides for a protein of 1.000 amino acids. Flie rRNA combines with ribosomal proteins and forms ribosome. Ribosome is inade up of rR \ A and protein. I he r12N A idrins 50 ‘Hi of the ribosome. It forith, a large part. about 80 ‘t/o. of iota! RNA. It act; as machine for the N‘ ‘,thesis of protein. DNA is a hcreditan material RNA is not hereditary material. It is used in the s) nthesis of protein. S. It is-present in nucleus It is present in nucleus and cytoplasm. The synthesis of DNA is called replication, The synthesis of DNA is called transcription.